ORTELIUS - Erythraei Sive Rubri Maris Periplus. ORTELIUS, A. - Erythraei Sive Rubri Maris Periplus. Erythraei Sive Rubri Maris Periplus. - ORTELIUS, A. Title : Erythraei Sive Rubri Maris Periplus.. Size : 14.0 x 18.1 inches. / 35.5 x 46.0 cm. Description :Decorative map covering the north-west coast of Africa, Arabian peninsular, India, Malaysia. In lower part inset map of Mediterranean. 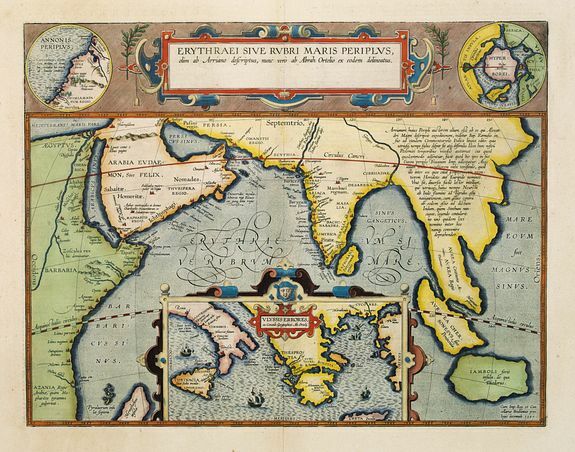 Upper right hand corner inset map Hyper Borei , as Ortelius puts it for better beautifying or proportioning of this map , and to remind the reader that in spite of all their exertions, a passage to the Fer East via the North Pole has not yet been found by the English or the Dutch. Condition : Paper slightly age-toned. Very good condition. Wide margins.